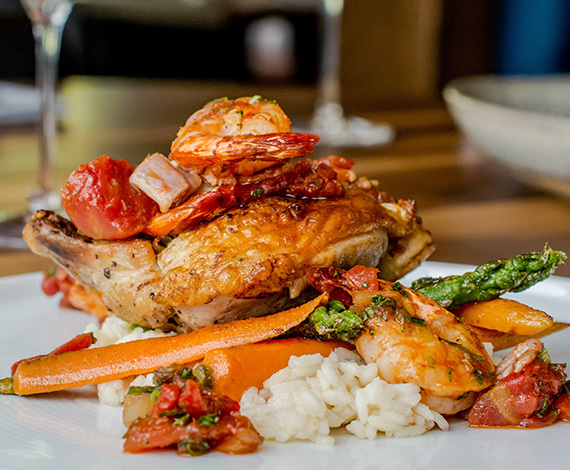 The Restaurant at Five Fishermen is known for its Nova Scotian Seafood, Canadian AAA & USDA prime steaks and an array of Chef-inspired menu items, prepared with uncompromising quality. Space is rustic-chic with soft lighting and stunning views. The ambiance beautifully complements the food. From a quiet weeknight dinner to a special private event, let us handle every detail. We want everyone to enjoy our delicious new menus; our gluten-free menu has so many options to choose from. The Five Fishermen has put finishing touches on some delightful new dishes. Choose from a varied selection of the finest seafood available, or indulge in our critically acclaimed prime center cut steaks, aged 28 days and wood fire grilled to perfection. Complement your meal with a selection from our wine menu — an award-winning list of more than 200 wines curated by our Sommelier. If a more relaxed experience is desired, visit our lively bar where you can sip classic and creative hand-shaken cocktails or a selection of micro-brewed beers and ales, regional wines, single-malt scotches and freshly squeezed juices while enjoying signature appetizers. Whatever the occasion, from a quiet weeknight dinner to a special private event, let us handle every detail. We’ll do the work. You bask in the glory. Private DiningEnjoy a welcoming atmosphere for casual social gatherings and business meetings alike. Our small fry is all grown up in a league of its own! Little Fish Oyster Bar, downstairs at The Five Fishermen. Come visit us soon!